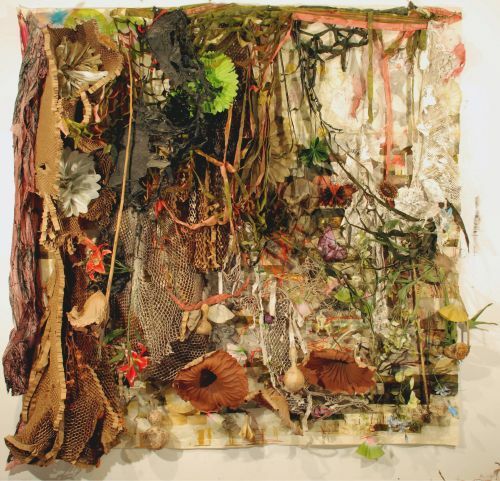 Pioneering installation artist Judy Pfaff presents dense, active, detritus beautiful wall sculpture in her show of new work, Sculptural Paintings, at Braunstein/Quay Gallery, San Francisco, through November 6, 2010. Pfaff, a MacArther Fellowship recipient, is best known for her large-scale installations, which she's been recognized for since the 1970s. The planned chaos she creates, incorporating huge varieties of materials, has been highly influential on a number of younger generation artists, including Sarah Sze, Jason Rhodes, and Tomoko Takahashi. And it is no wonder: among the apparent disorder is a profound sense of rich spatial relations; Pfaff is a formalist, albeit the work is also very intuitive. 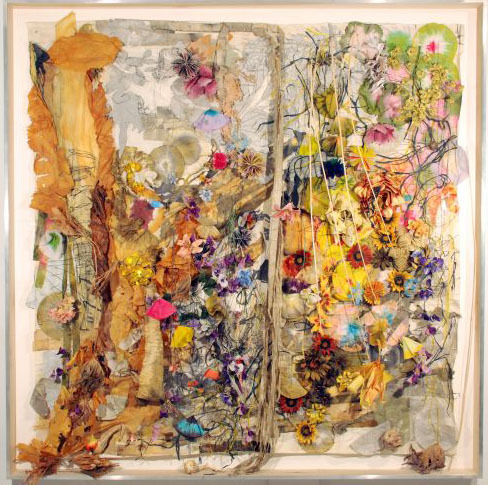 In these new works, Pfaff takes the diorama approach to her work. Each piece is a large wall-hung glass-fronted box. It feels as if into each, Pfaff has compressed an entire installation. Each work is a journey, an adventure through the carefully placed items, colors, and layers; along the way, note the many Asian references, in aesthetics and objects. The deft use of positive and negative space maintain a lively momentum. 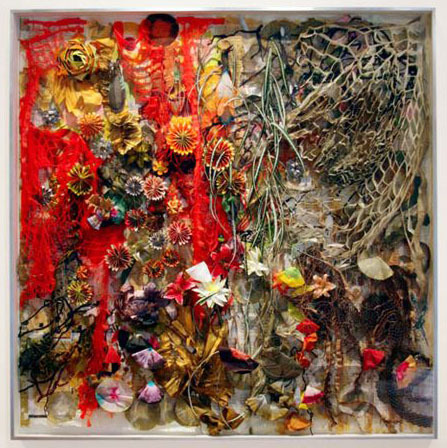 As writer Tom Collins appropriately stated in a 2009 review about similar pieces: "The filled-to-the-max aspect of these works approximates the clutter of daily experience and could be construed as a visual, three-dimensional stream-of-consciousness response to it." 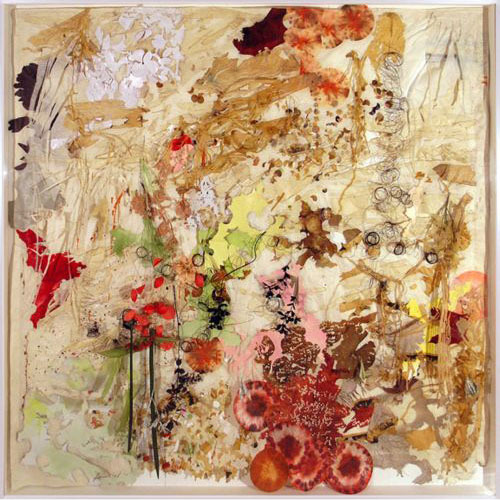 Pfaff does use a huge array of materials in these works, many of which are from her immediate surroundings, such as items from her garden, including dried gourds. Also found are origami objects, wire, various types of paper, coffee filters, artificial flowers, ink, and found images. Surface texture is important. As are signs of wear--coffee filters stained from use, burnt edges of paper. These objects have a story and depth. Every aspect of them, as well as how they're placed and how they relate to each other, participate in the experience. As with past work, these works immediately appear to be totally unruly. But an orderliness begins to reveal itself over time leading to a rewarding sense of calm and satisfaction. Pfaff is a master of her art. What a great pleasure it is to witness her explorations.